Last monday it snowed at my house. That might not seem like a big deal to you but it’s a pretty rare sight in Sacramento. Supposedly we had some flurries a few years ago but it’s been over 20 years since I’ve seen snow on the ground in my home town. For the record it was only a dusting and it was gone by 10am, but it gave me an opportunity to get out and do some shooting close to home that afternoon. I found this pretty little scene up in the Sierra foothills off of highway 49. I couldn’t believe that I found so snow less than 40 minutes from my house. Photographing snow can be tricky. In any automatic mode the camera will underexpose the scene and make the snow a dingy dark grey. Generally speaking, manual exposure is almost always a simpler approach; especially when doing landscape photography. It’s a hassle to deal with exposure compensation or AE locking. I just meter on the bright white snow and set my exposure meter 1.5 – 2 stops to the right, (to the left if you live in Nikon land), and fire away. There’s no need to do anything else with exposure unless the light changes. The next time you’re photography snow, switch it to manual and give it a try. You’ll like the results. 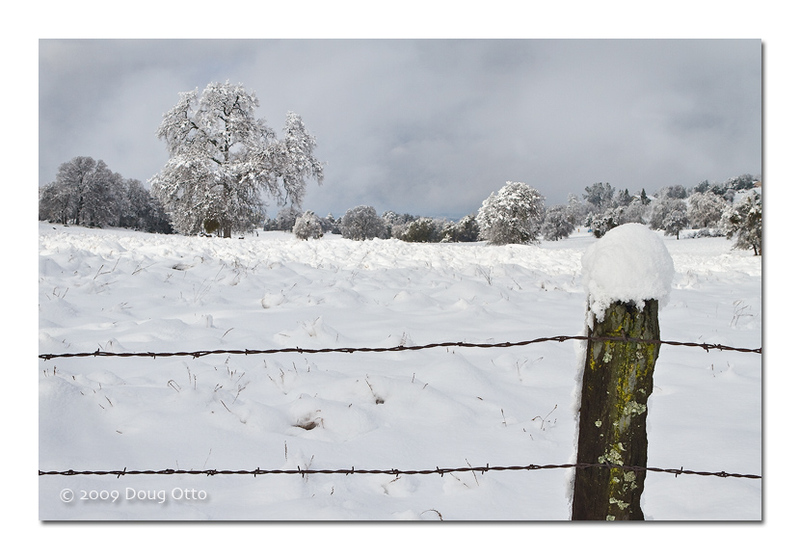 This entry was posted in Photography and tagged Canon 7D, doug otto, eldorado, highway 49, manual exposure, oak trees, Photography, Sierra Nevada foothills, snow. Bookmark the permalink.